Founded in 1908 as a state teacher’s college, the University of Mary Washington (UMW) became an independent university in 2004. Today, UMW is a coeducational public university with a student population of approximately 4,400. More and more students are applying to the university every year, with 5,000 undergraduate applications received in 2014 alone. The previous paper-based process was a customer service nightmare. Each application packet resulted in a huge influx of paper. UMW wanted to increase the number of applications but couldn’t deal with what they already had. The previous undergraduate admissions process was very manual and cumbersome. Applications had to be printed before being inserted into a manila folder that would become the student’s application file. The rest of the file had to be assembled based on all the other documents that would arrive with the application. The whole folder would then be physically carried to different territory mangers for review. Students weren’t notified of their application status until the very end, which resulted in numerous calls to the front desk to confirm receipt of documents. The front desk employees couldn’t provide answers to the applicant’s questions because documents were very hard to find. UMW used Laserfiche to reduce the application processing times from one month to just a few days. 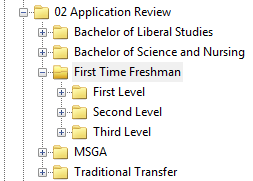 Each applicant has an individual folder in Laserfiche to store all components of his or her application. 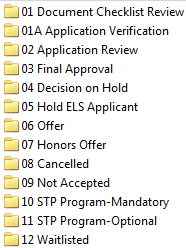 As the application file moves through the various stages of the admissions review process, it is routed to the folder corresponding to the correct step as described in the screenshot below. 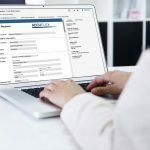 Applications are automatically loaded into the Banner student information system as they are received form the online Common Application and CollegeNET. Any PDF copies of documents are imported to the applicant’s folder. Processors scan any orphan documents as they are received. 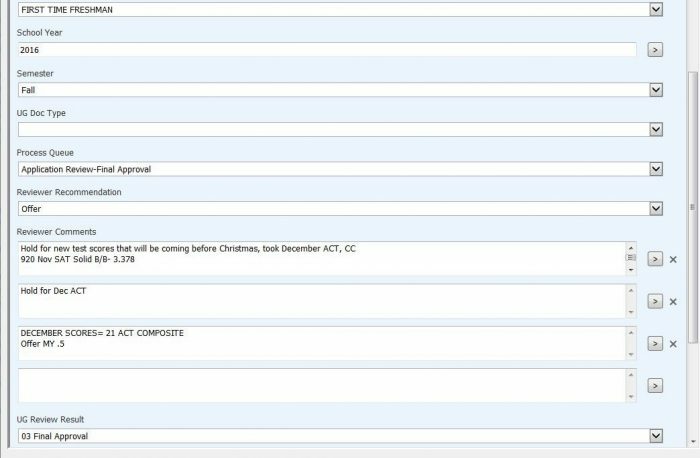 Once the file is complete, Banner is updated automatically and Laserfiche Workflow moves the folder into the Verification folder. In this stop, the processing staff reviews the file for completeness and assigns the appropriate territory manager based on the student’s address. The territory manager performs the first review and leaves comments in the file’s metadata. The file can then be assigned for second review. If the second reviewer agrees with the first reviewer, the review phase ends. If not, the file is sent on for a third review. The processor records the decision in Banner and generates the decision letter through Microsoft and Sharepoint. The offer packet is then assembled for mailing to the student. New application processing time has been reduced from one month to a few days. Transparency has increased and students can now view the status of their application, along with any missing documents, online. Territory managers can now review applications from anywhere as they’re not tied to their desks. Learn more about modernizing the admissions approach in this free eBook.